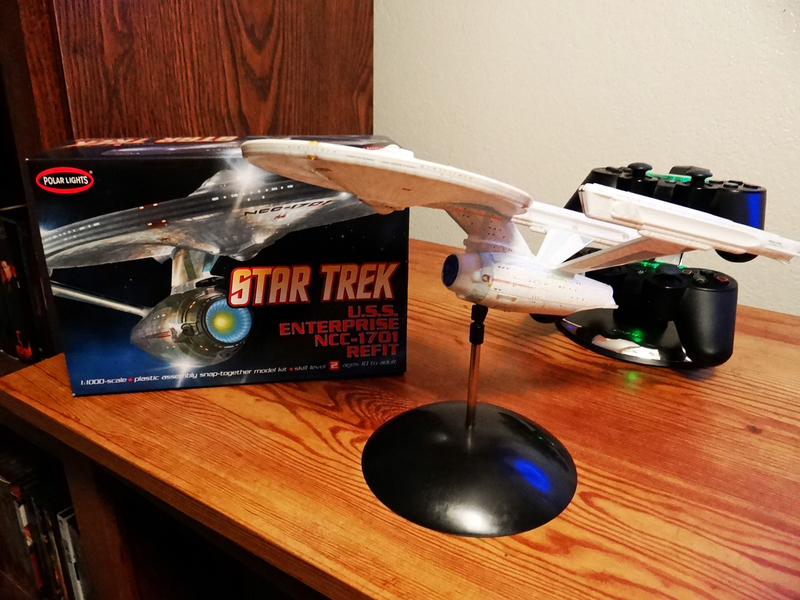 Lazy day today…may work more on the Enterprise; she’s coming along nicely. 🙂 Got her about halfway done…I have the saucer pretty much done and detailed (tho I still have more decals to add to it) and have the neck attached…now I need to hit the nacells and secondary hull. Y’know…then the Next Generation ship had the ability to separate at the saucer, many criticized it for not being cool…that was planned to happen from the start. 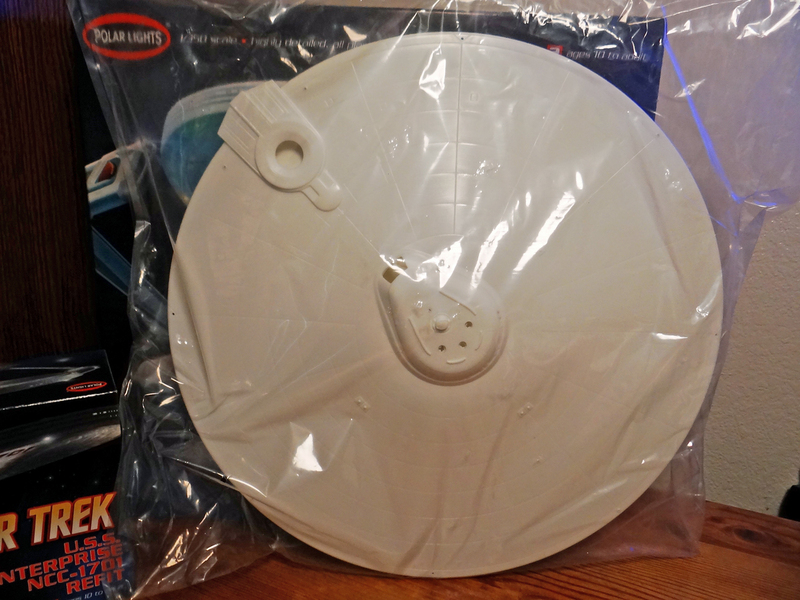 🙂 Even Kirk’s Enterprise back in the 60’s was supposed to have this…there’s some details under the saucer where landing struts were even hidden under, I believe. The difference was the “D” was the only one that could do the separation and re-attach…the other ships needed a spacedock to achieve this. As for now? How about some Angel? Update this Plug-In, update that Plug-In, update another Plug-In…update, update, update, UPDATE! That’s what I meant about Plug-Ins. Started to type, and had to update two of the Plug-Ins I use for this blog…then once I did and got a screen saying that I’d done it successfully, I got another notation saying that I needed to update a Plug-In I’d just finished updating! :/ Whatever. Editorial Sarcasm: Kickstarter For TucsonTied????? Why not a Kickstarter for TucsonTied.com??? Donate at the $10 level and I’ll do a blog post dedicated to you. Donate at the $50 level and I’ll send you the used pantyhose or stockings the model wore at the shoot. Donate at the $200 level and you get the above and the pic will even be signed. Donate at the $1000 level and you get the above and a special, personalized short video from me and the model thanking you for your support. Donate at the $10,000 level and, when you provide your own airfare, you can attend the shoot!!! So…I wrote all of this just to get your opinions. Should people who, by and large, already have the money they’re asking for from fans be able to use Kickstarter? Or should the funding platform be only allowed by people IN NEED to use? Do you think that Stallone, Lee and other big-name stars who use the platform (Did I read that Google page right? Did the people who made the “Veronica Mars” movie REALLY get $5 million?!) are wrong to do so? Is the exploitation of Kickstarter by the wealthy…or do even the wealthy have needs that KS can solve? 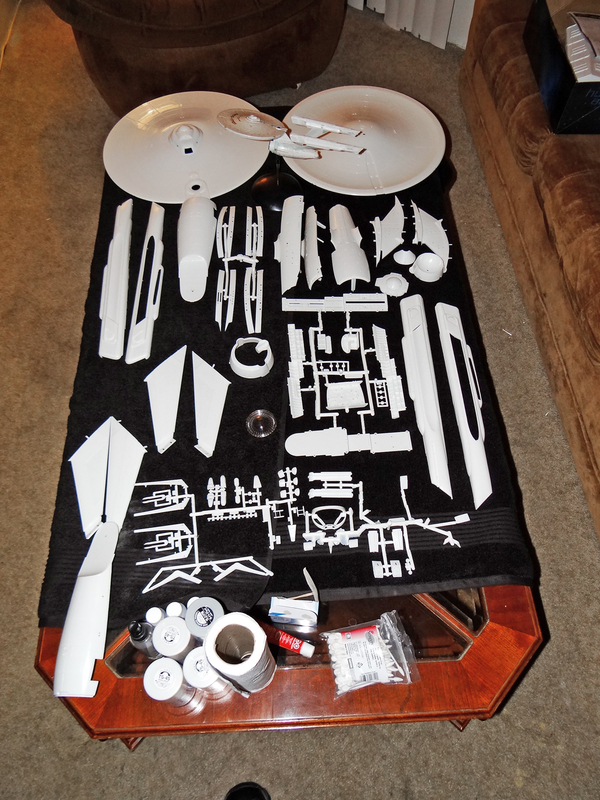 The build goes well…I’m applying the Aztec decals on the bottom of the saucer now. Kinda disappointed at the lack of detail…they barely show up. 🙁 Well, we’ll see if that gets better as I add more. 🙂 As for you all…how about a touch of Stacie Snow to start your Monday out? Yes, that’s my foot at the very bottom of the pic…whatever. 😛 Like I said last time, the parts have a “release agent” on them when they leave the factory…it’s how they get the parts free from the mold. That had to be washed off before priming (warm water bath with Dawn dish washing liquid); this is the parts drying after that. Note that the assembly covers my whole coffee table, outside of the paints, glue and such at the front. 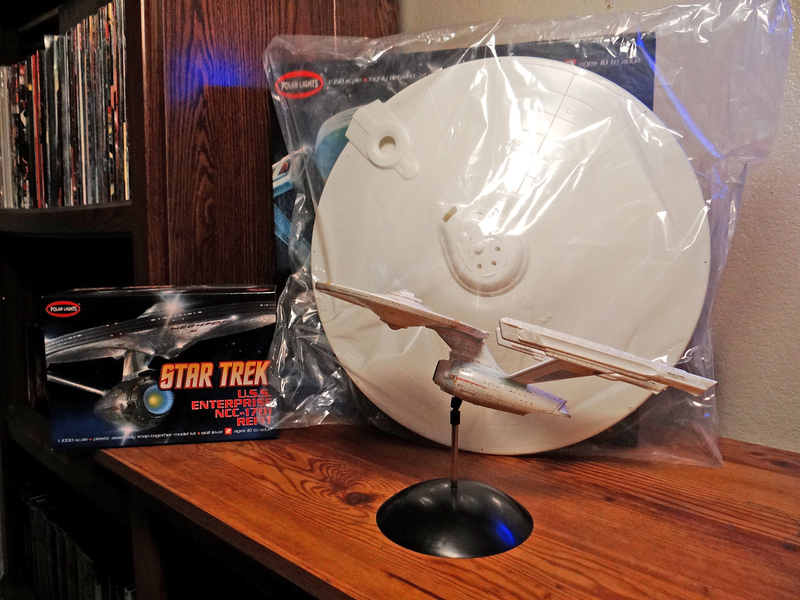 If you’re looking it over, thinking, “Hey, Tolstoy; the Enterprise doesn’t have two necks and four nacelles” and such, remember that this is all the parts…everything comes in halves. 😉 Heck, the secondary hull is in 4 pieces, really. 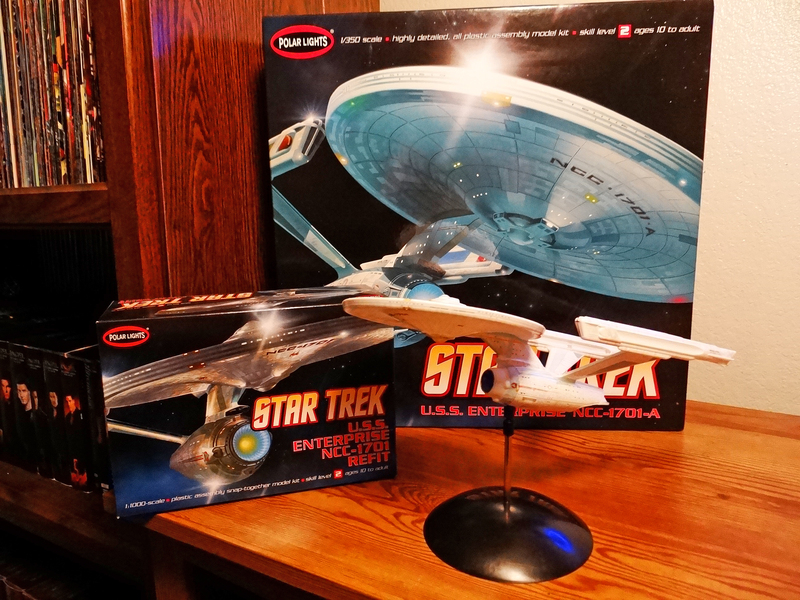 I DO have two different bottoms to the ship…one is the original version and the other is for the “refit” version; I’ll have that spare once the kit is finished some months down the line. Saturday, Part 2: Wants Vs. Needs…This Time The “Wants” Won Out.